If you haven’t seen Makey Makey have a look at this amazing piece of kit. It basically simulates a USB keyboard and mouse, but allows you to map things connected to the Makey Makey board to keyboard buttons and mouse buttons. The exciting bit is the “things” that you can map, which are basically any objects (including human beings) which conduct electricity. Watch the video below and you will get the idea. Gareth Ritter of askthemusicteacher fame, pointed me in the direction of Makey Makey and asked me if I could write a program to map keyboard buttons to slides in PowerPoint, so that he could map real world objects to different slides in a slideshow. I put this together using C# and you can download it below. Click here to download Powerpoint Controller for use with Makey Makey. It requires XNA4 runtime (a bit unnecessary I realise but I was reusing code from an XNA game to save time) and will run on Windows XP, Windows 7 & Windows 8. 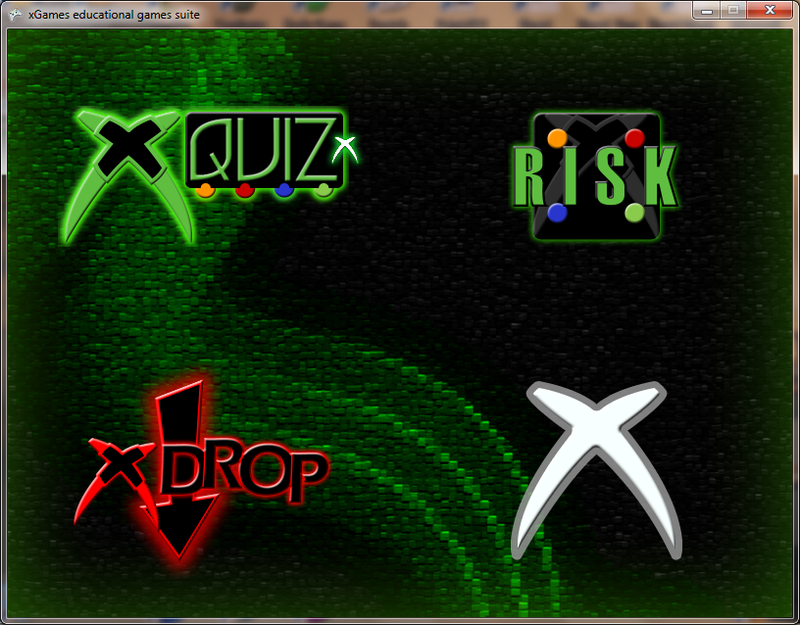 I am releasing an updated version of my xGames educational suite of quiz based games which make use of wireless XBOX360 controllers. This version uses XNA4 to bring it into line with my Kinect game releases. I have also made improvements to the games; the most notable being that the three 2D games now have a single front end as shown above. Another big advantage is that xQuiz, xDrop and xBots also now all share the same question folder bank which means when you create a quiz for one it will instantly be available in the other 2 games as well. I have also packaged them up in a proper professional installer file, which contains the various runtimes needed for the games such as .net and xna4 runtime. This means that if you download and run the installer file below it will install everything you need to get the games going and it will create shortcuts etc. It also will install the drivers for the wireless XBOX360 receiver and controllers for WinXP 32-bit, Vista 32-bit, Win7 32-bit and Win7 64-bit. Click here to download xGames version 2.2. To avoid the file size getting too massive, I left out the controller drivers for WinXP 64-bit and Vista 64-bit as I doubt many people are running them, but if you need the drivers for them they are below. Kinect Magic Cursor allows you to use Kinect connected to a Windows 7 pc to control the windows mouse pointer and perform left clicks. Once you install the software you simply use your right hand to control the mouse pointer by standing in front of Kinect and moving your hand. To simulate a left mouse button click you just raise your left hand above your shoulder. It certainly could have plenty of uses, an interactive presentation projected onto a whiteboard or wall, which could then be controlled by a user standing in front of it controlling it with their arms is one use and I’m sure you can think of many other uses. Release 1.2 comes with source code after I had a few requests after the last release. ESC key Quits the application. 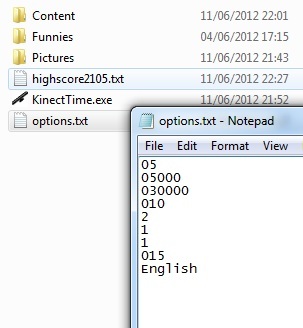 K key toggles between kinect and mouse control. LEFT-ARROW & RIGHT-ARROW keys change the scale, which is basically how far you need to move your hand in each direction to move the pointer to the edge of the screen. UP-ARROW & DOWN-ARROW keys allow you to adjust the angle of the Kinect camera. SPACE key freezes the video feed into the application, which is useful if you are running on a slow PC. S key starts the video feed again. You will need a Windows7 PC, Kinect SDK v1.5 and XNA4 runtime installed and obviously a Kinect (XBOX360 Kinect or Windows Kinect). 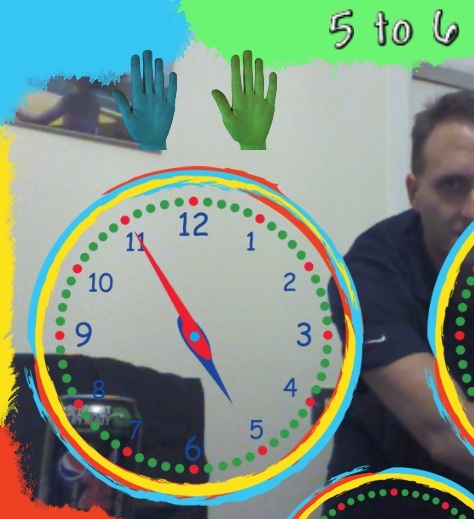 Click here to download Kinect Magic Cursor version 1.2 installer. 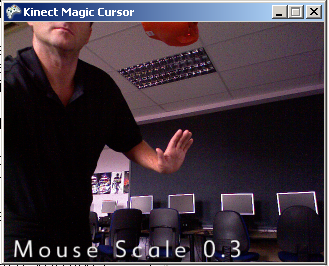 Click here to download Kinect Magic Cursor version 1.2 source code. Once you run the application you can minimise it and it will still function, however you will need to click back into it to exit it and stop the Kinect mouse simulation from running. If you already use my xGames educational games suite and have a wireless XBOX360 controller with USB wireless receiver for Windows then you should try this. It allows you to use a wireless XBOX360 controller as a wireless mouse and multimedia remote control. It is very useful as a wireless presenter device for the likes of powerpoint (Right and left bumpers perform left and right arrow clicks which allow you to navigate slides in powerpoint), however you can also control the mouse with the left stick something you can’t do with most multimedia remotes. Version 1.2 has a couple minor bug fixes and when you simulate cursor keys using the D-PAD, it has a slight delay between each cursor key press as I felt it was too rapid. I am also releasing the source code this time too. Left and right sticks on the controller will control the mouse pointer. A Button performs a left mouse button click like a real mouse, you can hold it down and perform operations like drag and drop. B Button perform a right mouse button click like a real mouse and can also be used for operations like drag and drop. Left Trigger simulates a left mouse button click and release, so can only be used for single-clicks. Right Trigger simulates a right mouse button click and release, so can only be used for single-clicks. X Button simulates a left mouse button double-click. BACK button quits the application. LEFT bumper button does a LEFT-ARROW keyboard press (useful for powerpoint). RIGHT bumper button does a RIGHT-ARROW keyboard press (useful for powerpoint). The D-PAD works as cursor keys, allowing you to perform LEFT, RIGHT, UP and DOWN cursor key presses. LEFT-ARROW & RIGHT-ARROW keys on the keyboard allow you to adjust the mouse speed from within the application. You can minimise the application and the controller will still function as a mouse. You will need a Windows 7/XP PC and XNA4 runtime installed and a wireless XBOX360 controller with a USB wireless receiver to plug into the PC. Click here to download xRemote version 1.2 instatller. Click here to download xRemote version 1.2 source code. I’m releasing 2 very small applications for Windows that are nevertheless invaluable. There is already software out there that does these jobs, but this is my take it them using XNA4. The first release came about as I was asked to do a magic wall thing using Kinect and I managed to put this together in about 5 hours (finished it at 2.30am), so it might not be perfect, but it’s worth a go. It basically allows you to use Kinect connected to a Windows 7 pc to control the windows mouse pointer and perform left clicks. Once you run the software you simply use your right hand to control the mouse pointer by standing in front of Kinect and moving your hand. To left-click you just raise your left hand above your shoulder. It certainly has plenty of uses, an interactive presentation projected onto a wall, which would then be controlled by users standing in front of the wall and controlling the pointer with their hand is our initial thoughts, but it could have so many other uses. There are various keyboard controls to set things within the application. Once you run the application you can minimise it and it will still function, you will need to click back into it though to exit from it and stop the Kinect mouse control. My second application is based on the first one, as I thought, “why not also do this with the wireless XBOX controller”. So if you already use my xGames and have a wireless XBOX360 controller with USB wireless receiver for Windows then you should try this. It basically allows you to use a wireless XBOX controller as a wireless mouse and multimedia remote control. A Button and Left Trigger perform a left-click. B Button and Right Trigger perform a right-click. X Button does a double-click.